I have only had the chance to spend a little bit of time playing around in the first chapter, and I have to say that so far I am impressed. The game is indeed a chibi remake of the console version of Final Fantasy XV. The plot of the Pocket Edition follows the same basic path, though there are a few missing scenes and elements. After all, Square Enix had to squeeze the game into something that will work well on mobile. Now, I would like to point out that if you are planning on playing through Final Fantasy XV on console or PC, you may want to hold off on the Pocket Edition (PE) so you can experience the story and gameplay in its full glory. Thanks to how similar they both are, the PE will undoubtedly ruin the plot of the console release. Of course, if you have no such plans, this mobile title appears to be a solid substitute. Oh, and before I get any further there are a couple of important things to go over if you plan on being able to run this game. It's very demanding, and the required specs are pretty high. First of all, you have to be on Android 5.0 or higher. You will also need at least 2GB of RAM. Your CPU needs to be clocked at 1.5GHz or higher. And at the very least you need 5GB of free storage space, or 8GB or greater if you want to play the high-resolution version. So far I have been running the game on my GS8+ at the highest settings possible and haven't noticed a single dropped frame. Despite the fact that I'm running it on high settings there are still a few noticeable low-resolution textures scattered throughout the game. Some of the objects in the environments don't look as good as they could, especially the roads that you drive on. I can't say this fact spoils my experience, but it is noticeable. Obviously compromises needed to be made so that the game could actually fit on our mobile devices. Other than the few low res textures, the rest of the Pocket Edition looks great. Sure, the chibi style is pretty simplified when compared to the console version, but I have to say this is probably one of Square Enix's best-looking games on Android. And at the very least it's the best-looking premium Final Fantasy title available for the OS. Surprisingly it even supports 18:9 screens without stretching the picture or cutting off important buttons. When you consider that Square Enix is notorious for games that often don't fit the vast swath of Android screens without some kind of letterboxing/pillarboxing, the 18:9 support is a welcome surprise. Short of the chibi look and streamlined plot, you may be asking yourself what else is different about it when compared to the console version? Well, combat is a big one. It is still action-based, but it's much more simplified. All movement relies on taps on the screen. There is no digital joystick, and there is no physical controller support. This means you have to get used to tapping where you want to go and whom you want to attack. When taking on a group of enemies, there are a few different moves you can pull off. If you tap on an enemy, you will start to auto attack them. When you long press on an enemy you will fly over to their location and smack them pretty good. This is helpful for quick movements and managing multiple enemies at once. You will also notice action bubbles that pop up from time to time. These are for pulling off special attacks and dodges. Many of them are only available for a limited time span, so you have to be pretty quick with your fingers if you want to pull them off with any modicum of success. Another difference between the console version and the Pocket Edition is the fact that the world is no longer open. The entire game is now very linear. Instead of going where you like you only have the freedom to participate in a few side quests that take place in the exact same zones you are already playing through for the main story. Any time you venture out to fight some enemies, you will be traversing a branching corridor. This style of gameplay is mostly broken up into levels. There are limits to where you are allowed to go, and it is very reminiscent of older Final Fantasy titles. It's also worth noting that Google Play Games Services is supported with the inclusion of an auto sign-in system, achievements, and cloud save. The latter is the most requested feature for Android games, so to see it supported out of the box is fantastic. This way you can quickly pick up where you last left off no matter what Android device you choose to play on. Honestly, I am surprised that Square Enix has knocked this one out of the park. I'm not that often pleased with the state of most of their mobile games. Many suffer from a lack of polish, not to mention rarely support several of our Android-specific features. 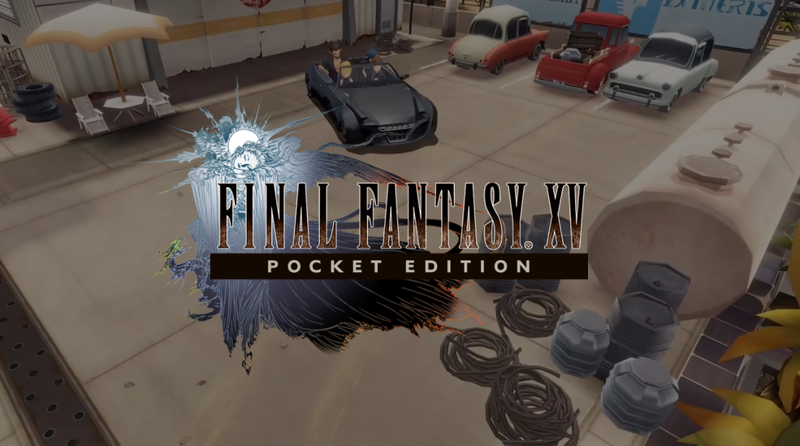 Final Fantasy XV Pocket Edition clearly stands well above the rest of their Android releases, which pleases me to no end and is hopefully a sign that Square Enix will take their mobile development a little more seriously going forward. Suffice to say, if you enjoy RPGs and own a device that can run Pocket Edition, you should install it right now.